One of the most successful techniques for spin fishing on the flats is to “wet line” soft plastics. This technique works best if the spinning reel is spooled with braid. My preference is to use 7 kilogram Nanofil or Fireline and attach a 1.5 metre length of 7 kilogram Amnesia monofilament as a shock trace. Fly fishermen will probably understand the principles involved as they are almost identical to those employed in traditional wet fly fishing. Essentially the angler casts slightly upstream perpendicular to the current. 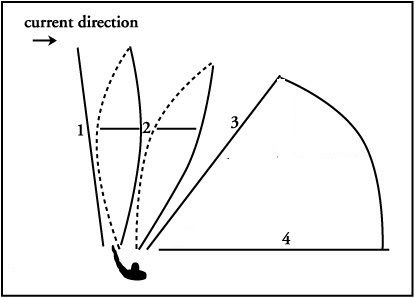 As soon as the lure starts to sink and drift downstream the line on the surface is repositioned upstream using the rod tip as shown in the dotted line in the diagram. This is termed “mending”. The aim of mending is to ensure that the lure sinks to the bottom unhindered by drag from the line on the surface and then travels downstream drag free with the lure leading the way. I generally mend until the lure gets to position 3 in the diagram and then just focus on keeping the line to the lure tight. There is usually no mistaking when a fish takes the lure as the hit is transmitted straight to the rod tip through the tight braid. A solid strike upstream is all that is needed to set the hook and guarantee pandemonium. Jig head weight is critical with this technique. Ideally there should be just enough weight for the lure to reach the bottom and hold it there. The lure should then gently kiss the bottom regularly as it bounces along, pushed by the current, in an arc towards the shore. I like to see my rod tip nodding each time the lure bounces across the bottom. Too much weight and the lure will catch on the bottom, too little weight and there will be no contact. The fish hold close to the bottom so that is where the lure must spend most of its time. 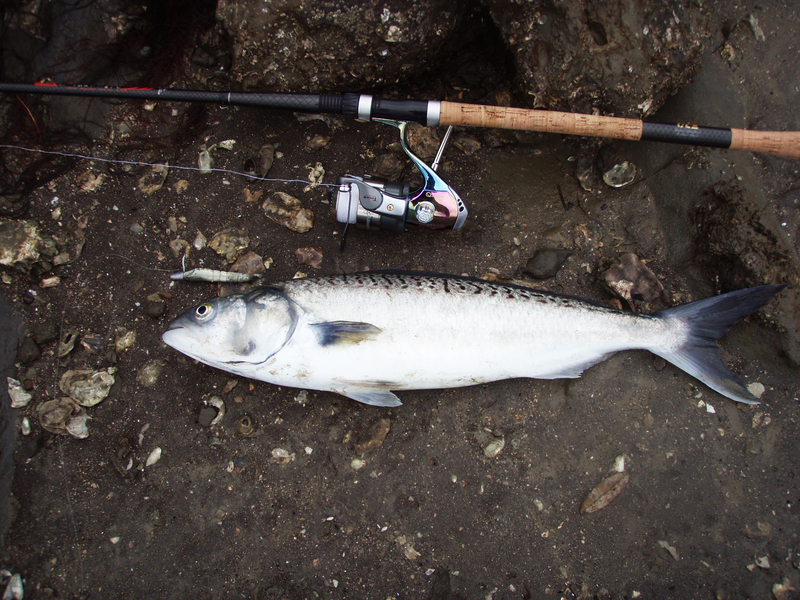 In the estuaries I fish jig head weights of 7 – 14 grams are ideal as the water depth is mostly less than 3 metres. Heavier weights will be needed when the current is strongest and it will be necessary to switch to lighter weights as the tide gets closer to its lowest ebb. If the depth of water is greater than 3 metres increase the jig head weight until you find the optimum weight to get the lure to the bottom. Another thing that you can do if the jig head is too light is to cast slightly higher upstream (11 o’clock) as this gives the lure more time to sink to the bottom before mending. Conversely if the jig head is too heavy then casting closer to position 3 in the diagram can prevent the lure from hanging up on the drift. 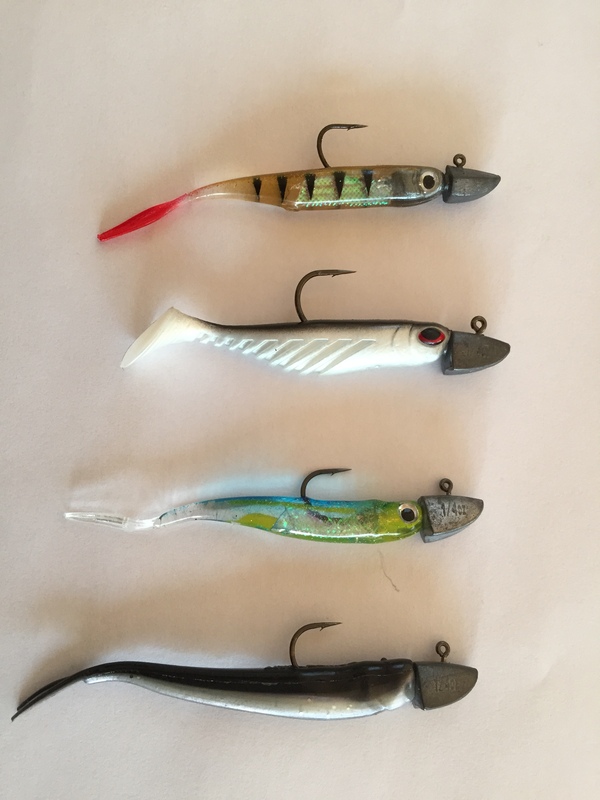 The image below shows some of the soft plastics that I typically use with this technique. I am a fan of small paddle tails and shads that are around 5 – 7.5 centimetres long as these are very representative of a lot of the small fish that flats predators target. Generally fish take at the start of the retrieve as soon as the soft plastic touches down or at the end when the lure is parallel to the shore facing upstream. A couple of twitches and a short fast retrieve at this point often elicits an aggressive response as any fish that have followed the lure in close attack when it looks like the prey is escaping. 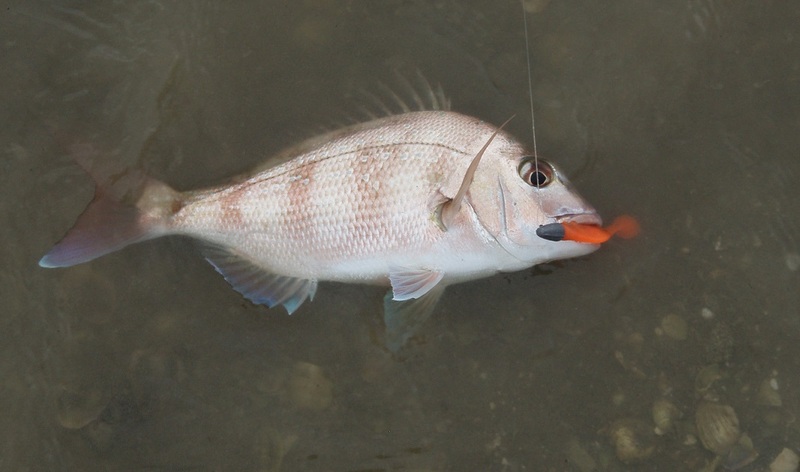 Snapper, kahawai, kingfish and trevally all fall for the “wet lined” ( or free drifted) soft plastic. My biggest fish landed is the almost legal kingfish pictured in the lead image for this article. I’ve lost at least five that were legal over the past 18 months. This clearly shows that big fish are opportunistic and will take small prey, especially when it looks injured and is easy pickings. Awesome , thanks for the insight. Cheers Stuart. Glad you enjoyed the post. Let us know how you get on trialling the technique at your secret spot.